Figure 1. Concept of a single satellite geolocation system using the correlation against known transmitter method. Another reason for increased interference are acts of terrorism and political turmoil, such as the systematic disturbance of western broadcast television in the North African and Near East region as well as in countries such as Egypt, Syria, Libya, and Iran. 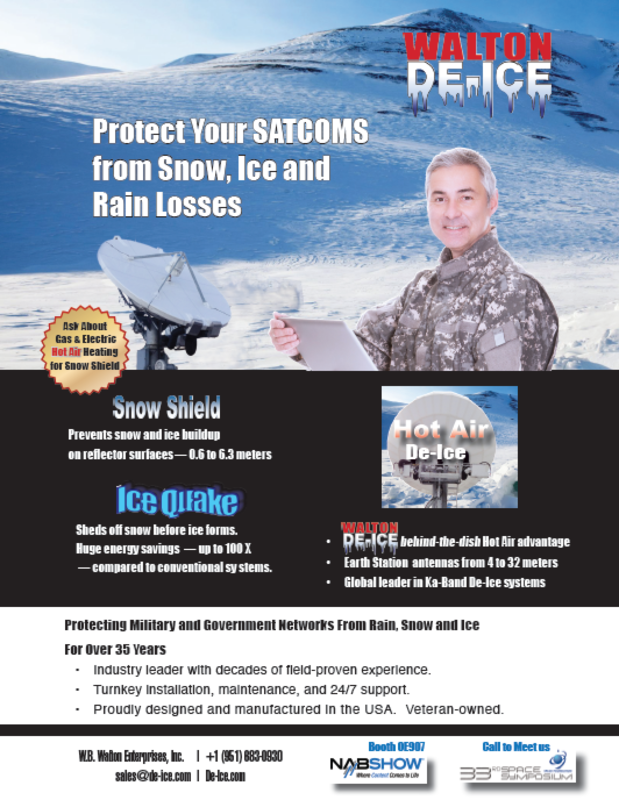 Satellite operators are becoming increasingly interested in solutions that detect interference, the main task of a satellite monitoring system, but also to localize its source, i.e., to geographically localize, or geolocate the transmitting station of an interferer. However, most localization systems have a crucial drawback: They need to receive the interference signal via two adjacent satellites in order to perform geolocation [1, 2, 3, 4, 5]. Another approach uses crosstalk measurements between signals received from multiple antennas/beams belonging to the same satellite [6, 7], and it has also been shown that frequency measurements of signals from a single satellite, taken at different times, can be used to locate an unknown emitter [8, 9]. Currently, the most promising approach able to localize the source of an interferer using a single satellite is based on the variation of signal strength with time. This technique relies on the fact that the signal strength of a carrier varies with time due to a number of factors, including movement of the satellite, atmospheric and weather conditions, and changes in power amplifier gain and antenna alignment at the uplink station. It turns out that there are similarities in the patterns of variation of signal strength for carriers originating from the same geographical area. This method is the subject of an Austrian patent . This article describes the concept and pros and cons of available methods able to localize the source of an interferer using a single geostationary (GSO) satellite. At present, there are commercial geolocation systems from different manufacturers available, all these systems use time and frequency difference measurements from two GSO satellites. Geolocation of radio transmitters affecting communication satellites in GSO orbit is a challenging task which is usually accomplished through analysis of time difference of arrival (TDOA) and frequency difference of arrival (FDOA) compound measurements. The main drawback of these geolocation principles is their necessity of having at least two satellites, which are close enough to each other, in order to have useful crosstalk energy on the adjacent satellite for the calculation. Even though several hundreds of GSO satellites are in operation from the main satellite operators, some of them are still “isolated”, meaning that the next adjacent satellite is separated more than 10 degrees. In this case the crosstalk is very likely too small in order to be measurable. Even in case an adjacent satellite is available, that does not necessarily mean that it can be used for geolocation. One of the main parameters which need to be known by geolocation systems is the exact position and velocity of the satellite (for both, the main and the adjacent satellite). These parameters are called satellite ephemeris data which have a significant impact on the accuracy of geolocation systems. In case the adjacent satellite is from a different satellite operator, such ephemeris data are often not known, or only with an accuracy which makes geolocation useless. 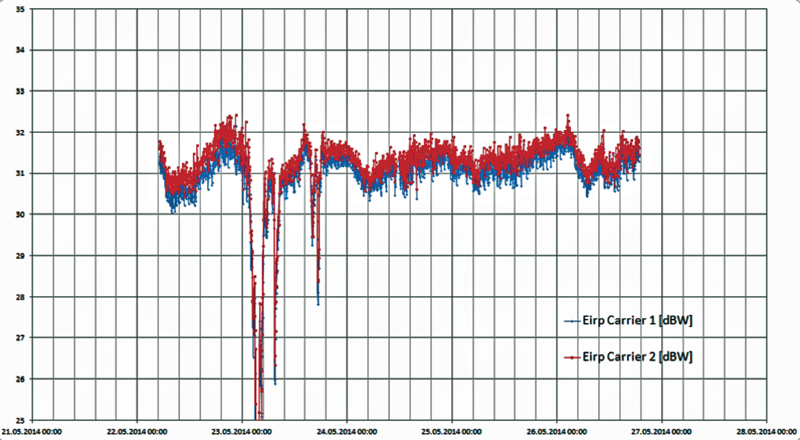 With the help of tracking systems you could calculate the ephemeris data from satellites even though no ephemeris data are available. But one of the preconditions of successful tracking is the availability of enough reference stations. A reference station is a known uplink station in terms of its localization (Latitude. Longitude), which transmits a known (reference) signal to the satellite to be tracked. 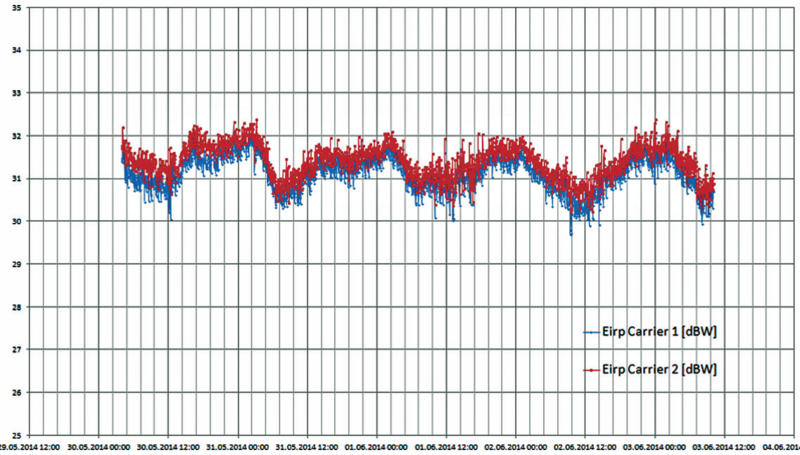 Needed are at least five to six reference stations in order to calculate the ephemeris data with sufficient accuracy. That sounds easy but means in reality a real challenge and is often impossible to achieve. The reason is that the operators often do not know from which station what signal is being transmitted. Should you be lucky enough to have an adjacent satellite available which is close enough to your affected satellite and you also know its ephemeris data very precisely; the next hurdle is that the crosstalk on the adjacent satellite needs to be in the same frequency area and polarization as from the interference signal on the main (affected) satellite. Taking all that into account, you can imagine that there are a lot of scenarios where geolocation is impossible with the current available tools and algorithms. Therefore, it would be a big advantage of having a geolocation system available working by just receiving the interference signal via a single satellite. Geolocation Method Using a Single GSO Satellite and Inverse Doppler Shift. Section 5.1.2.8 of  already describes a possible method for geolocation of an unauthorized transmitter on Earth by using a single GSO satellite. This method makes use of the small Doppler frequency shift caused by the motion of a GSO satellite for determining the transmit location of an unauthorized transmitter. The application of Doppler created by a single satellite for geolocation has been used previously for satellites in the lower orbits, which have significant motion with respect to Earth and their position changes at different times. Hence, the large motion of these LEO satellites creates a significant and easily observable amount of Doppler frequency change. The Doppler frequencies at several time instances can fix a ground emitter. 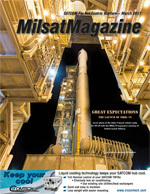 Indeed, this is the technique adopted in the search and rescue satellite (SARSAT) localization system. The use of Doppler from a single GSO satellite for the purpose of localization is not straightforward and is a much more challenging problem. This is because the motion of a GSO satellite with respect to the Earth is by nature very small and the resulting Doppler shift is also very small and much more challenging to accurately observe. In addition, the use of Doppler is further complicated by the fact that the uplink frequency of the ground emitter is unknown, the exact frequency of the satellite local oscillator is unknown and the satellite ephemeris data can have significant uncertainty in the satellite position and velocity . Another drawback of this approach is its sensitivity to frequency variations caused by the uplink station HW itself (e.g., frequency sources and PLL equipment being affected by temperature variations, etc.) which easily can reach or even exceed the influence of the Doppler shift. In fact, geolocation systems on the market using this method have shown that the reachable accuracy is beyond 100 km and therefore not really useful to identify the uplink station of an unauthorized transmitter. They may work with acceptable accuracy when the interference signal is received via an inclined orbit satellite, which shows greater movements compared to regular GSO satellites, resulting in a bigger Doppler shift. This technique relies on the fact that the power of a satellite signal, transmitted from a certain uplink station on the Earth to the satellite and down to a receiving station, varies with time due to a number of factors, including movement of the satellite, atmospheric and weather conditions (on the uplink and downlink side), and changes in power amplifier gain and antenna alignment at the uplink station—see Figure 1. It can be assumed that signals transmitted from the same uplink station or the same geographical area show the same power variations in the same time frame, whereas signals transmitted from different geographical areas will show different power variations in the same time frame. The following example in Figure 2 at the top of the next column shows the power variations of two signals (red and blue) transmitted from the same uplink station over a period of four days. A 24 hour variation coming from the satellites movement can be clearly identified. Figure 3 shows an example of power variations caused by weather effects (big spikes). In both cases the power variations are more or less identical since both signals are transmitted from the same uplink antenna. In order to find the transmit station of an interfering signal, one has to calculate the similarities of the interfering signal with other known signals. This is usually done in the frequency domain by correlating the signals or parts of them. Therefore, the correlation algorithm is most crucial to geolocate the interferer in terms of accuracy, efficiency and success. This concept is applicable in case a number of different signals are transmitted from the same uplink station or in the same geographical area as the interference signal. All signals (including the interferer) could be permanently monitored by a carrier monitoring system (CMS) and any change of the interfering signal in power, frequency or bandwidth (e.g., forced by weather influences) is tried to be correlated with the measurements of other signals investigated. In case of a positive correlation caused by e.g. weather influence, HW dependencies, etc., it can be assumed, that the uplink location of the interference signal is identical or close to the uplink location of the known carrier. The challenge in this method lies in the correlation approach since the measurements are typically not performed at exactly the same time depending on the monitoring strategy (e.g. Round-robin). This influence is supposed to significantly affect the correlation result requiring relevant measures (time delta depending weighting, plausibility checks, ambiguity mitigation, etc.) to be investigated. Furthermore, the method could be enhanced in terms of taking into account additional information such as HW related information belonging to the known transmit stations, third party weather information, etc. For example, weather information could be used for additional ambiguity mitigation in terms of identifying/eliminating cases which are in conflict with certain weather situations. Based on this concept, Siemens Convergence Creators has developed the single satellite geolocation system SIECAMS ILS ONE using techniques from quantum information theory. The system computes a signature, which represents the EIRP variations for a carrier from a particular period of time. SIECAMS ILS ONE defines a distance measure to numerically quantify the degree of similarity between two signatures, and by computing the distance between the signature for an interfering carrier and the signature for each carrier in a database of known carriers, the carrier with the closest distance can be identified to the interfering carrier. In other words, this identified carrier needs to be transmitted from the same geographical area as the interfering carrier. In case the transmit location in terms of latitude and longitude of the identified carrier is known, the geographical area can be drawn as a circle, with a radius representing the distance value, on a map. 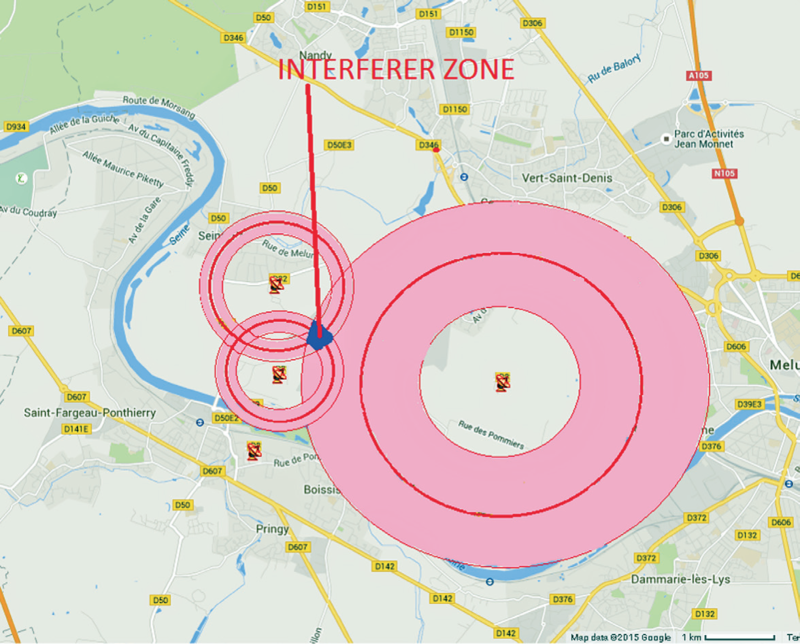 The accuracy of the system can be increased in case several carriers with a similar signature and therefore with a close distance to the interfering carrier can be identified and visualized as different circles on a map as shown in Figure 4. The intersection of the different circles represent the very likely position of the transmit station of the interfering carrier. In this article, two currently available methods for geolocating a satellite interference signal via a single GSO satellite have been described. The method using the Doppler shift has the clear disadvantage in its sensitivity to frequency variations which are often caused by the uplink station HW and which are overlaying the very small Doppler shifts caused by the motion of GSO satellites resulting in an unacceptable accuracy. It may work when the interference signal is received via an inclined orbit satellite, which shows greater movements compared to regular GSO satellites. 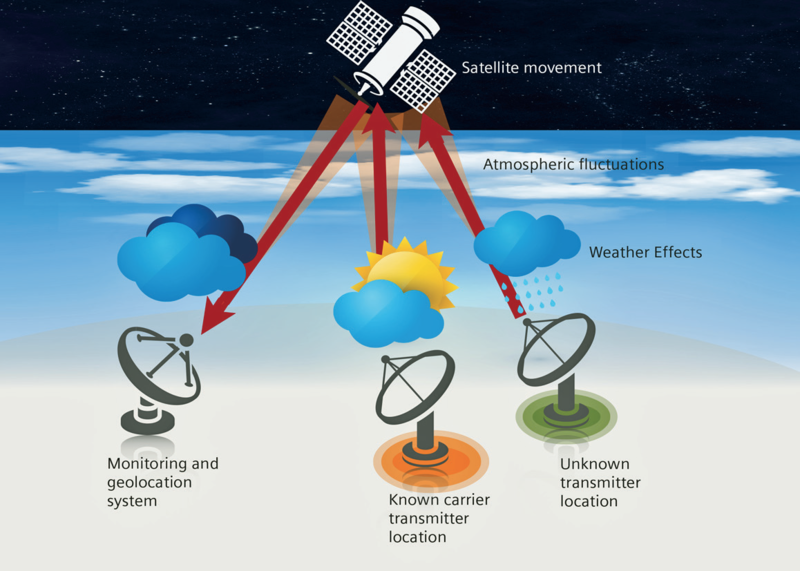 The second method realized in the SIECAMS ILS ONE product from Siemens Convergence Creators, which makes use of the signal power variations caused by the movement of the satellite, atmospheric and weather conditions, could already prove its usefulness for satellite operators by successfully localizing interference signals which could not be localized by traditional geolocation systems working with two adjacent satellites. In the best case, the system can identify the uplink antenna of the interference signal in case other carriers are transmitted from the same antenna at the same time. In other words, the system can reach an accuracy of 0 (zero) meters! In addition a significant improvement in accuracy and reliability has been achieved by applying statistical analysis methods to continuous measurements, making the entire system more robust by eliminating interfering downlink effects. SIECAMS ILS ONE was developed with the vision of realizing the best possible quality of service for all users of satellite communication. In the context of this philosophy, Siemens Convergence Creators takes their responsibility seriously by regularly delivering improvements of the solution's capability to help operators pinpoint interference sources. Erwin Greilinger is Sales and Product Line Manager for Siemens Convergence Creators’ Satellite Communication and Monitoring Solutions. Thus he is responsible for the definition of products for monitoring and troubleshooting the quality of satellite communications systems, product marketing, technical and commercial sales activities. Prior to joining the Siemens Space Business, he was section head for Broadband Management Systems and Fast Internet Solutions. This business sector handled projects in the area of Cross Domain Management Systems especially for Broadband IP and ATM networks. He holds a degree in Electrical Engineering from the Federal Secondary Collage of Engineering in Vienna, Austria. Chestnut PC. Emitter location accuracy using tdoa and differential doppler. IEEE Transactions on Aerospace and Electronic Systems March 1982; AES-18(2):214–218, doi:10.1109/TAES.1982.309230. Smith WW, Steffes PG. Time delay techniques for satellite interference location system. IEEE Transactions on Aerospace and Electronic Systems March 1989; 25(2):224–231, doi:10.1109/7.18683. Effland J, Gipson JM, Shaffer DB, Webber JC. Method and system for locating an unknown transmitter. US patent US5008679 (A) April 1991. Haworth DP, Smith NG, Bardelli R, Clement T. Interference localization for EUTELSAT satellites-the first European transmitter location system. International Journal of Satellite Communications and Networking 1997; 15(4):155–183, doi:10.1002/(SICI)1099-1247(199707/08)15:4<155::AID-SAT577>3.0.CO;2-U. Grant H, Salt E, Dodds D. Geolocation of communications satellite interference. 2013 26th Annual IEEE Canadian Conference on Electrical and Computer Engineering (CCECE), 2013, doi:10.1109/CCECE.2013.6567745. Adeogun RO. A robust MUSIC based scheme for interference location in satellite systems with multibeam antennas. International Journal of Computer Applications November 2013; 82(12):1–6, doi:10.5120/14165-2322. Fredrick BC. Geolocation of source interference from a single satellite with multiple antennas. Master’s Thesis, Naval Postgraduate School, Monterey, California March 2014. URL https://calhoun.nps.edu/handle/10945/41379. Ho D, Chu J, Downey M. Determining transmit location of an emitter using a single geostationary satellite. US patent US8462044 (B1) June 2013. Kalantari A, Maleki S, Chatzinotas S, Ottersten B. Frequency of arrival-based interference localization using a single satellite. 2016 8th Advanced Satellite Multimedia Systems Conference and the 14th Signal Processing for Space Communications Workshop (ASMS/SPSC), 2016, doi:10.1109/ASMS-SPSC.2016.7601472. Nölle M. Verfahren zur Identifikation von Störsendern. Austrian patent AT515001 (B1) August 2015.